In this test we examine the consistency of a sample of bitumen by determining the distance in tenths of a millimetre that a standard needle vertically penetrates the bitumen specimen under known conditions of loading, time and temperature. This is the most widely used method of measuring the consistency of a bituminous material at a given temperature. It is a means of classification rather than a measure of quality. It measures the hardness or softness of bitumen by measuring the depth in tenths of a millimeter to which a standard loaded needle will penetrate vertically in 5 seconds. Heat the sample until it becomes fluid. Pour it in a container to a depth such that when cooled, the depth of sample is at least 10mm greater than the expected penetration. Allow it to cool in an atmospheric temperature. Clean the needle and place a weight above the needle. Use the water bath to maintain the temperature of specimen. Mount the needle on bitumen, such that it should just touch the surface of bitumen. Then start the stop watch and allow the penetration needle to penetrate freely at same time for 5 seconds. After 5 seconds stop the penetration. 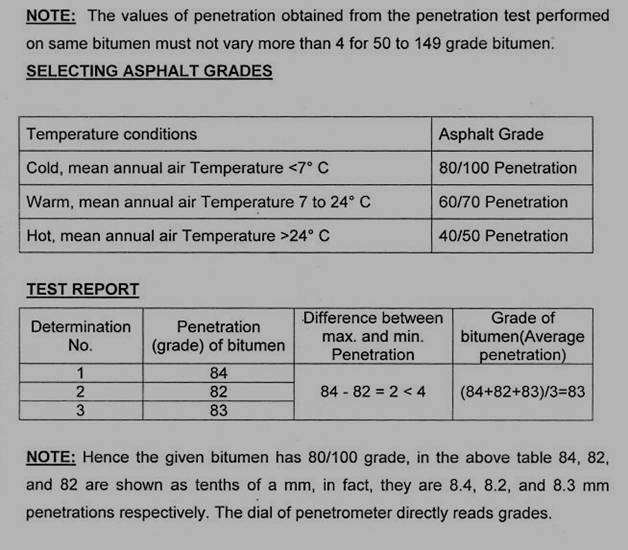 Result will be the grade of bitumen. Take at least three reading. 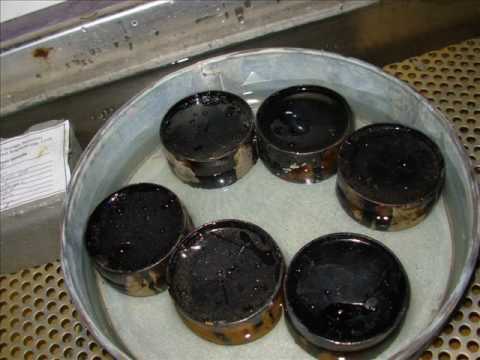 Penetration test is used to measure the consistency of bitumen, so that they can be classified into standard grades. Greater value of penetration indicates softer consistency. Generally higher penetration bitumen is preferred for use in cold climate and smaller penetration bitumen is used in hot climate areas. The bitumen is softened to a pouring consistency, stirred thoroughly and poured into containers at a depth at least 15 mm in excess of the expected penetration. In hot climates, a lower penetration grade is preferred.